Most people know that’s not the case, but that tends to be the prevailing stereotype. And not just among whites, blacks, and Latinos. It’s harder when even Asian Americans believe in the stereotype. 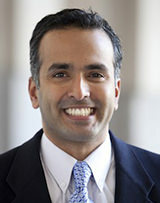 Ramakrishnan is Professor of Political Science and Associate Dean of the School of Public Policy at the University of California, Riverside. He directs the National Asian American Survey, which recently revealed the jaw-dropping finding that some Asian Americans don’t consider South Asians as Asian American. Previously, I spoke with his NAAS cohort Jennifer Lee about this survey question here. In my interview with Ramakrishnan, we discuss who has the power to define who is Asian, and how the “Asian American” umbrella is being threatened. Is an AMEMSA–Arab, Middle Eastern, Muslim, South Asian–category inevitable? “If you’re brown and someone thinks you’re Muslim, you get a different racial experience,” Ramakrishnan told me on Emil Amok’s Takeout. “That’s what “AMEMSA” captures. But what happens then to the broad Asian American category of 21 million and growing when 5 million South Asians can’t identify and adopt a new category? Ramakrishnan also talks about how the NAAS findings may explain why there wasn’t a massive mobilization from Asian Americans to protest the murder of Srinivas Kuchibhotla earlier this year. While Vincent Chin’s murder inspired the activism of Asian Americans 35 years ago, the ire over the Kuchibhotla hate crime has not had a similar impact on the community. Ramakrishnan said it should have, and the fact that it didn’t reveals Asian America’s implicit and explicit biases. Uh-oh. We’re reverting back to the other prevailing stereotype. Non-boat rockers. Just get on the boat. Don’t miss it. Get off the boat. Just don’t rock it. But maybe we should. The upcoming 35th anniversary of Vincent Chin is the time for some reflection. In 2014, I wrote about how the entire community should use the days Chin was in a coma from June 19 to June 23 to think about what it’s like to be Asian American. We are coming up to that time. 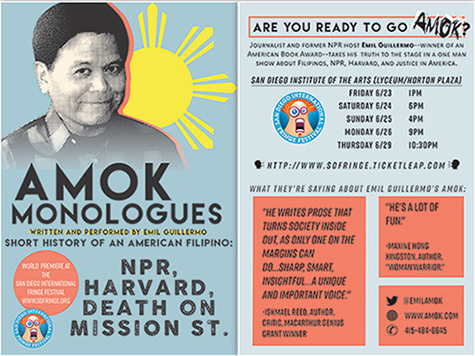 It’s a wide ranging Emil Amok’s Takeout, including a special treat: I read my annual Father’s Day essay, part of a story in my “Amok Monologues: A short history of the American Filipino–NPR, Harvard, Death on Mission St.,” which I’m premiering at the San Diego International Fringe Festival, June 23 to 29. If you’re in San Diego, come on by! It’s another part of my exploration of the solo performance form. It’s funny. It’s tragic. It’s amok! 00: Intro, Emil comments on news, the week’s gun violence and the NBA champion Golden State Warriors.